Is that kiosks ONLY? Or can we use the mobile app to make our selections as well? Thank you! This is brilliant. Thanks, Karen. We’re really excited about MyMagic+ and glad you are, too. Also, at parks that have a tiering system (like EPCOT), will we get to choose from ANY tier after our initial three FP+ have been used? This seems like a step in the right direction, but it is a little frustrating for people who might want to choose Wishes or other late-evening activities as one of their very most important FP+. In that case, they cannot take advantage of getting more than three FP+. It would be too risky not to book a late-evening FP+ and try to get it on the day-of as a fourth FP+. Also, will we really need to use the kiosks to get additional FP+ or can we use our MDE Apps? Thanks! What happens if you book a FP+ for something like Illuminations? Would it be impossible to get a 4th FP+ since there’s the “must use all 3” requirement? Hi Timothy, guests will need to use their first three FastPass+ entitlements before they are able to select another experience. Don’t worry, even if your FastPass+ selection window expires without you using it, you will still be able to make a FastPass+ selection. Yay! We will be there in the beginning of May. Do you need to visit a kiosk to get the additional fastpasses or will you be able to make them via the My Disney Experience App on a smartphone? Great question, Erika. Yes, for now, guests will need to use the kiosks in the park to reserve FastPass+ entitlements beyond their first three, although their additional FastPass+ entitlements will show up in their plans within the My Disney Experience app and they will be able to modify them there. We’re evaluating the possibility of enabling guests to select additional FastPass+ entitlements within My Disney Experience down the road. Thank you. This seems like a step in the right direction. Unfortunately, this will frustrate anyone whose highest priority is for a later-in-the day FP+ such as Wishes. Anyone who chooses such an attraction as one of their initial FP+ will be unable to use more than 3 FP+ in a day, which seems a shame. It would be too risky to *not* pick their top choice FP+ and hope to get it as a fourth FP+ on the day-of. I hope you will consider other changes, such as allowing people to select a new FP+ every time they use one (or even after using two). Also, will the additional selections need to be made from the kiosks? Why not from the MDE App? Thank you. Can the 4th fast pass be for a ride that you have already selected? Say my first 3 passes are for Space, Splash & Thunder mountain. Can my fourth pass be for space? or do I have to pick a ride i have not ridden yet? Definitely, Raymond. Once you’ve used your first three FastPass+ experiences (or the arrival windows for your selections have passed) you can select a fourth from any available FastPass+ experience. Having three boys, I’m very familiar with the desire to do one more “mountain”. Does this mean you can not add more FP+ through the app after you’ve used the original 3? I second those questions: can they only be booked at the kiosk and what if you have a fireworks fast pass? How does this affect the parks with tiers? Once the 3 FPP have been used can i now choose a FPP for another headliner? How about when I park hop? Will I be able to get a fp there? I think it’s great! Going to a kiosk is easier than going across the park to an attraction, then returning to that attraction again at our scheduled time as we had to with the old Fastpass system. why do i think the non-fast pass lines will get longer? This is great for those who can plan ahead, but for those with health issues, it’s really hard. What if you only use 2 of your FP+ selections before heading to a different park? Will you be able to schedule any FPs at the second park, or is it a requirement to first use all 3 FP+ selections at the first park before setting up one for any subsequent parks? This is great! And the timing couldn’t be better as we arrive at WDW next Thursday! Have been an Annual Passholder for 20+ years, am a local and have been using Fastpass since its inception but this is just getting very convoluted because it’s not being explained fully to us and many “features” make planning difficult. The high demand/limited capacity FP+ attractions are gone almost as soon as they are available; especially the night time ones. The rule that you must use all 3 FP+ selections before you can get a 4th FP+ eliminates anyone who has later FP+ selections from getting additional ones. Also, what if you miss a FP+ window? You haven’t technically “used” it so do you forfeit any future FP+ for that day? I know, because FP+ REQUIRES us to select 3 FP+ selections (even if I only want 1), I know from the moment of booking that not all of my FP+ selections will be used and some of those might be later in the day. Sorry, it’s just frustrating trying to learn all the rules and spending lots of time booking FP+ the week my friends are here from out of town only to find the ules have changed…. It’ll be interesting to see how this works out. I thought part of the allure of Fastpass+ was that you didn’t have to run back and forth between attractions to grab fastpasses and then wait for their time to go past to get another. But ultimately, after the initial three are used that’s exactly what we’ll be doing – running back and forth between Fastpass+ locations (and waiting in lines to get help from the cast members with the ipads to set up the fastpasses for you) and the attractions you wish to see. It still doesn’t seem like all the kinks are worked out yet, but hopefully it will one day be all that it’s promised to be! One of the things I dislike about the FP+ choices is that to get on a ride I want to, I have to choose rides I won’t ride at all – will this update apply if I cancel the Fast Pass I won’t use? I am also curios to find out if the 4th FP+ can be selected through the My Disney Experience App, as this would be much more convenient, and save so much time and hassle for the guests. I have an illuminations fast pass at night, so will I be able to get Fast Pass for other parks in morning? Let’s say I’m at Epcot and I chose Soarin as my CLASS A ride ahead of time. After I use all 3 of my scheduled selections, will I then be able to schedule another CLASS A ride like Test Track? I am in the parks a lot and I LOVE the new FP+ system. In the past I have been very critical of Disney when it closed the Adventurers Club which was my favorite attraction at DLR and WDW. But the just announced changes make what I thought was a great system even better. I believe my guest experience is even better because I do NOT have to run getting the old Fast Passes and I know I will get to experience my favorite attractions before I go to the parks. Of course FP+ means I now spend a lot more money on food and merchandise when I am in the parks which of course is great news to stock holders. This sounds awesome! I loved being able to have 3 chosen ahead of time and now being able to add more after those are used or if we park hop is really the perfect combination! I’m a Disney travel agent, and from what I have been told/understand, you will be able to choose a 4th fastpass from any ride available (even if you have already ridden that same ride that day). If you choose to fastpass a late ride or firework show, you will not be able to get any additional fastpasses. Yes,you will need to get all subsequent (after initial 3) fastpasses from a kiosk, not the phone app. These will also work with park hopping (after initial 3 fastpasses are used, you can hop to a different park and visit a kiosk there to gain an additional fastpass etc). Can we use the My Disney Experience app to make additional selections? Also will the Seven Dwarves Mine Train have Fastpass+ when it opens? I really love the convenience of MagicBands and Fastpass+ but just wondering if there are any plans to add all Walt Disney World information and logic to the MagicBands. As an Annual Passholder, DVC member, D23 member and Tables and Wonderland card holder, it would be wonderful if I didn’t have to carry all those cards around with me. Instead, it would be great that when I flash my MagicBand for payment, the system could recognizes my memberships and then automatically apply the best discount for the transaction, where it be dining, merchandise or whatever. I am also wondering the same as others. If I need to go to a kiosk to get new FP+ times, are there many kiosks throughout the parks, or will I have to run all over to find one? What will the lines be like to wait to get a 4th or subsequent FP+ selections? If the lines are very long, it’ll really detract from having the ability to get another selection. Will I be able to make a selection for any ride/attraction that has FP+ from any kiosk, or will certain kiosks only be for attractions in certain lands? Will this expand to being able to make selections with MDE in the future? Maybe for resort guests? Also does having a later FP+ selection disqualify you from having more than 3? With 4 small children having a good viewing spot for parades or fireworks without a huge wait would be wonderful, however not if it means my children have to give up riding rides during the day. We’d just have to skip the parade instead, which would leave me feeling very sad, b/c I am so excited about the new Festival of Fantasy Parade. But my trip is about my children’s happiness, not mine, so I will miss the parade rather than make them miss rides or shows they’re interested in. Late August/early September, we’ll be at WDW on property for our little boys’ first birthday and first visit. We’d love to be able to plan things for our family, but we’re nervous. In the past we’ve ridden Buzz many times over and over again, legacy FP has made it possible. This will be our first trip where all 3 of my older children will be big enough for the Mountains, so they’d like to ride those, but they also want to ride Buzz, and other rides. In the past we could do so, but currently it looks like they’ll be able to either ride the mountains, OR ride Buzz and one or two other rides, but riding both will be out of the question. The standby line wait times are much longer than they’ve been in the past, so just hopping onto a different ride while we wait for FP times may not be possible. We are optimistic about how FP+ will affect our trip, though parts of it are intimidating b/c it’s new. The more information we have, the better our trip will be. Our children are very excited about their MBs and can hardly wait to see what happens after our trip when they bring the bands home to their Disney Infinity platform. This looks very promising. A BIG step in the right direction for Fastpass+ Thank you Disney for listening to your guest. As others have pointed out, there are two concerns / questions with this policy. Number one is, what happens to guests that are holding a Fastpass+ for something like Illuminations? Will they then not have the option of getting other in park Fastpasses during the day because they have not used all 3 of their original passes? Question number two is simply, can the additional passes be obtained through the My Disney Experience website, or will it be necessary to use an in park kiosk? It would be awesome if this could be done through the app. Definitely better, but a little disappointed that we don’t have an official answer about using the app. Seeing the current kiosk lines, not looking forward to having to use the kiosk. Also I’d much prefer if you could get a Fastpass+ after using your first one (otherwise if you have an evening one you are basically stuck). I am SO excited for these changes. We enjoyed using the FP+ system in December, but were frustrated at some of the limitations, such as the categories and number of FPs that you can reserve. This change takes care of both of those issues. Thank you! Hooray!!! This is the news I’ve been waiting for! This makes FP+ great! And it’s just in time for our 15th anniversary trip next month!!! I spoke with a Cast Member about this yesterday. They were just informed of this and from what I understood you can book an additional one FP based on availability once you have used your first three or the return windows have passed. After your additional FP has been used or the return window passes, you may select another FP, etc. However, the additional FP selections may only be made at a kiosk in the park you wish to ride and not on the app. If you have park hopper capability you will be able to reserve your additional FP selections at another park once in that park at their kiosks. It sounds like you can use your additional FP on any attraction no matter what tier it is in and even on an attraction that you have already visited earlier in the day with FP. Hope that helps answer some of these questions! I’m glad we’ll be able to get additional FP+. However, what I’d like to see is the ability to get FEWER FP+. Currently, I am forced to select three whether I want to or not. I’ve never been a big fast pass user, so normally I might get one for Soarin’ in Epcot, maybe one for It’s a Small World in the MK, and Kilimanjaro Safari in AK. I don’t do thrill rides, so Test Track, Space Mountain, and Everest just ain’t happening! So I end up getting two additional FP+ that will go unused. I think that’s going to mess with wait times, don’t you think? Fabulous news! Still, the unintended consequences clearly have not been thought through. Now there will be a strong incentive to book your first 3 fast passes as early as possible in your first park. No one will want evening fast passes. Families wishing to park hop will have to send one parent rushing to park #2 to make the second fast pass reservations while the other parent takes the kids back to the pool for a break. Then, that poor parent will go back to the hotel, try to relax after all that hustling, and then go back to park #2 with the family for the late pm/evening. Will fast passes even be available for the second park, especially for top rides? For example, we usually go to EPCOT at 4 or 5 pm for a few rides and dinner after spending the morning at another park. Is there any shot of getting an evening Soarin’ fast pass even if I run there at 11 am after spending the morning at the MK? Clearly, using the app will be next. It has to be. I think the complexities just got worse, but thank you, Disney, for listening. We’ve been going to Anaheim where legacy fast passes are still available allowing you to ride and ride and ride, wrapping fast passes in 2 parks. Please don’t convert Disneyland Park until you have every single kink worked out of this! It is my understanding that at this time, you will have to use an in-park kiosk to secure an additional FastPass. You cannot book additional FastPass+ with the My Disney Experience mobile app (at least for now). Only 1 additional FastPass+ can be made at a time and only when your initial 3 selections have been used. 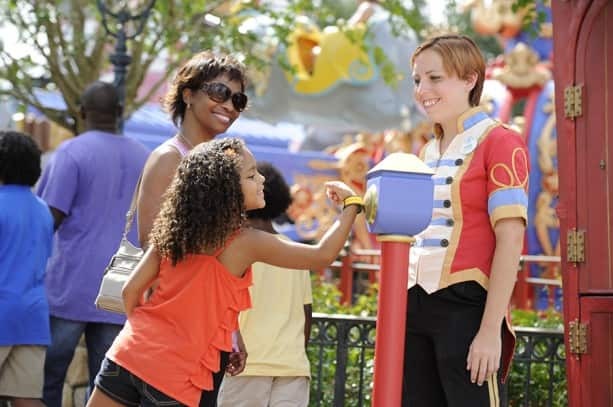 If you are park-hopping, you must make your additional FastPass+ selections from a kiosk inside that park (ex. you cannot book Toy Story Mania from a Magic Kingdom kiosk). Your original 3 FastPass+ selections must be used before you can make a selection in another park. The tiered selections at Epcot and Hollywood Studios do not apply to the additional FastPass+ selections. If one of your original FastPass+ selections has been made for close to park closing, you will not be able to make extra FastPass+ selections. i hope this answers some of the questions I’ve read. This makes FastPass+ actually usually and almost comparable to the old FastPass system! I’m hoping eventually additional selections can be made from the MyMagic app. I’m also hoping that evening event FastPasses (Fantasmic!, Wishes, etc.) shouldn’t count against your three initial FastPasses. Although generally speaking my family wouldn’t use those anyway. My family park hops a lot and typically uses only two fast passes in a park. From what I am reading, we will have to pick a third which we may or may not use in the first park, and although we can now park hop, we are still not able to split our FP choices from the get go? I would like to be able to say, I am going to MK and AK today. I want to use our 1st two FP in MK and then pick the third for AK, knowing generally what time we would get there. I think if they would take restrictions off of the initial 3 choices, that would help a lot with park hopping and having to use 3 (since you can’t choose less) before you could pick another, even at another park. And since we have to use a kiosk instead of the app it appears, there is a good chance the FP in the second park of the day could be gone anyway. They are getting better with this, but still have a lot of kinks to work out! Thank you! I was pretty bummed about not being able to use Fastpass+ at all while Park Hopping on our upcoming trip. I agree with Heather though, i would like to be able to use two fastpasses at Magic Kingdom in the AM, and also reserve ahead something like Fantasmic at HS in the PM… b/c as she said, by the time we get to HS in the PM, all the fastpasses will probably be gone. Thanks for listening to the customers Disney, that is why we love you. At parks that have a tiering system will we get to choose from ANY tier after our initial three FP+ have been used? Also, won’t this force everyone to choose morning slots for their fast pass plus options? What about guests who book FP+ for fantasmic or wishes? are they just out of luck in getting additional fast passes, or will the 2 hour rule somehow apply as it had on the legacy system? At the California Adventure park in Anaheim, their evening World of Color fast passes are not connected to any of the ride fast passes. This seems to work well there. Disney, it seems like you need to do the same thing here ASAP for Fantasmic, etc. fast passes. By the way, World of Color is awesome! How do you find the answers to all of these questions being asked?